The Tibetan Plateau , also known as the Tibel-Qingai Plateau or Qinghai-Tibetan (Qingzang) Plateau (Chinese: 青藏高原; Pinyin: Qingzang Gaoyuan) is a vast, elevated plateau in Central Asia covering most of the Tibet Autonomous Region and Qinghai Province in China and Ladakh in Kashmir , India . It occupies an area of around 1,000 by 2,500 kilometers, and has an average elevation of over 4,500 meters. Sometimes called "the roof of the world," it is the highest and biggest plateau, with an area of 2.5 million square kilometers (about four times the size of Texas or France ). The Tibetan Plateau is surrounded by large mountain ranges. The plateau is bordered to the northwest by the Kunlun Range which separates it from the Tarim Basin, and to the northeast by the Qilian Range which separates the plateau from the Hexi Corridor and Gobi Desert. Near the south the plateau is transected by the Yarlung Tsangpo River valley which flows along the base of the Himalayas , and by the vast Indo-Gangetic Plain. To the east and southeast the plateau gives way to the forested gorge and ridge geography of the mountainous headwaters of the Salween , Mekong, and Yangtze rivers in western Sichuan and southwest Qinghai. In the west it is embraced by the curve of the rugged Karakoram range of northern Kashmir . It has been empirically shown to be the most remote place on Earth. The Tibetan plateau has been an important strategic area throughout Chinese history. plateau is a high-altitude arid steppe interspersed with mountain ranges and large brackish lakes. Annual precipitation ranges from 100 mm to 300 mm and falls mainly as hailstorms. The southern and eastern edges of the steppe have grasslands which can sustainably support populations of nomadic herdsmen, although frost occurs for six months of the year. Permafrost occurs over extensive parts of the plateau. Proceeding to the north and northwest, the plateau becomes progressively higher, colder and drier, until reaching the remote Changthang region in the northwestern part of the plateau. Here the average altitude exceeds 5,000 meters (16,500 feet) and year-round temperatures average −4 °C, dipping to −40 °C in winter. As a result of this extremely inhospitable environment, the Changthang region (together with the adjoining Kekexili region) is the least populated region in Asia, and the third least populated area in the world after Antarctica and northern Greenland .
."Temperatures are rising four times faster than elsewhere in China, and the Tibetan glaciers are retreating at a higher speed than in any other part of the world." "In the short term, this will cause lakes to expand and bring floods and mudflows." "In the long run, the glaciers are vital lifelines for Asian rivers, including the Indus and the Ganges. Once they vanish, water supplies in those regions will be in peril." Monsoons are caused by the larger amplitude of the seasonal cycle of land temperature compared to that of nearby oceans. This differential warming happens because heat in the ocean is mixed vertically through a "mixed layer" that may be fifty meters deep, through the action of wind and buoyancy-generated turbulence, whereas the land surface conducts heat slowly, with the seasonal signal penetrating perhaps a meter or so. Additionally, the specific heat capacity of liquid water is significantly higher than that of most materials that make up land. Together, these factors mean that the heat capacity of the layer participating in the seasonal cycle is much larger over the oceans than over land, with the consequence that the air over the land warms faster and reaches a higher temperature than the air over the ocean. The hot air over the land tends to rise, creating an area of low pressure. This creates a steady wind blowing toward the land, bringing the moist near-surface air over the oceans with it. Similar rainfall is caused by the moist ocean air being lifted upwards by mountains, surface heating, convergence at the surface, divergence aloft, or from storm-produced outflows at the surface. However the lifting occurs, the air cools due expansion in lower pressure, which in turn produces condensation. In winter, the land cools off quickly, but the ocean keeps the heat longer. The hot air over the ocean rises, creating a low pressure area and a breeze from land to ocean while a large area of drying high pressure is formed over the land, increased by wintertime cooling. Monsoons are similar to sea and land breezes, a term usually referring to the localized, diurnal (daily) cycle of circulation near coastlines everywhere, but they are much larger in scale, stronger and seasonal. 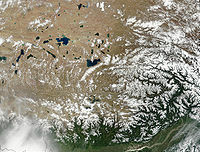 The seasonal monsoon wind shift and weather associated with the heating and cooling of the Tibetan plateau is the strongest such monsoon on Earth. One of the greatest advances in human culture is the development of nomadic pastoralism, the adaptation by nomadic people to survive on the world's grassland by raising livestock rather than crops which are unsuitable to the terrain. Nomads currently surviving on the Tibetan Plateau and in the Himalayas are the remainders of nomadic practices historically once widespread in Asia and Africa. Image:TibetanPlateau.jpg|Tibet Autonomous Region, Qinghai Province and Sichuan Province of China lie on the Tibetan Plateau.File:Himalaya composite.jpg|The Tibetan Plateau lies between the Himalayan range to the south and the Taklamakan Desert to the north. Global warming benefits to Tibet: Chinese official. Reported 18/Aug/2009. Oracle Thinkquest Education Foundation. monsoons: causes of monsoons. Retrieved on 22 May 2008. BBC Weather. The Asian Monsoon. Retrieved on 22 May 2008.